Deepika Padukone’s All About You is one of the most popular private labels of Myntra. With creative inputs from the superstar, the brand offers an amalgamation of western and Indian wear that is widely accepted by the women in India. The brand offers multitude of different designs with regard to women’s clothing. It is the perfect boho chic fashion brand in India that often dabbles with floral prints and breezy fabrics. Over the months of summer, the brand became enormously popular and stood out as the most successful celebrity fashion brand on Myntra. In a recent interview on ET Now with Bollywood actor Deepika Padukone and Myntra & Jabong’s CEO Ananth Narayanan, the business partners revealed the way forward for the brand with regard to business as well as creative strategies. Narayanan sees a bright future for the brand and says that the fashion label is able to strike a chord in the hearts of Indian women. Especially in Tier II and III cities and towns the girls relate well with the celebrity and consider her as a fashion icon that bodes well in terms of sale. Padukone says that partnering with the leading fashion marketplace has been a mutual decision that has proved beneficial for its growth. She says that Myntra has been the absolutely right partner for All About You. The idea was to move beyond the typical vanilla endorsement, instead a way for them to come to an equal arrangement that helped both parties to create a brand that touches the hearts of the people in India. Going forward Narayanan mentioned that the fashion brand is definitely one that has the potential to hit the 100 cr mark. In the upcoming festive season, they see a huge demand for the brand. He also said that the brand has the potential to reach the global markets in the near future. Since the brand is popular for their ethnic offerings, they see a lot of growth in the upcoming festive season. With festivities like Diwali and Dussehra, Indian traditional wear will be a big hit among Indian girls and women. The actor specifically mentioned that the best partnerships are built on trust and learning from each other and that she has found that with Myntra. She said that there’s lot that she has learned from the company with regard to sales and meeting targets while the company picked her brains with regard to creativity and designs. It is never easy to run a clothing brand on your own and reach successful returns in such a short period of time and this has only been possible because of the great partnership that she had with the online fashion moghul. Narayanan further mentioned that the company is betting big on omnichannel strategies. When asked what is in store for All About You in the near future, Deepika says that not everything will be revealed. So, if we took the hint right, something of a big surprise is about to come forth from the brand in the upcoming months. After all it is October, the festive season is almost here. Technology has, and continues to play an indispensable role in improving and simplifying our lives. At breakneck speed, we have seen appliances, vehicles, devices and tools evolve from what they were when we were young and had just discovered them, to how we perceive and use them today. Take for example your constant companion – something you are probably holding in your hands right now: your mobile phone; over the years, you witnessed your grandfather’s giant black receiver phones, the sleeker ‘land-line’ receivers with helical cords that inadvertently always found itself intertwined in your fingers as you held the receivers connected to them, the new flanged cordless phones – a novel idea at that time, succeeded by the first cellular phones, and finally, to the device that has come to be so precious to us. In nearly every other sphere of life, we have had technological change as our constant companion. In stark contrast, the clothing and fashion industry has only seen advancements that have in no way been influenced and molded by technology. All up until very recently, this was very true. However, with Indian e-commerce giants Myntra’s latest advents, starting with the establishment of the Innovation Lab to the recent launch of Blink Go! – A wearable smart device – and all the stellar work that they have done, in between. 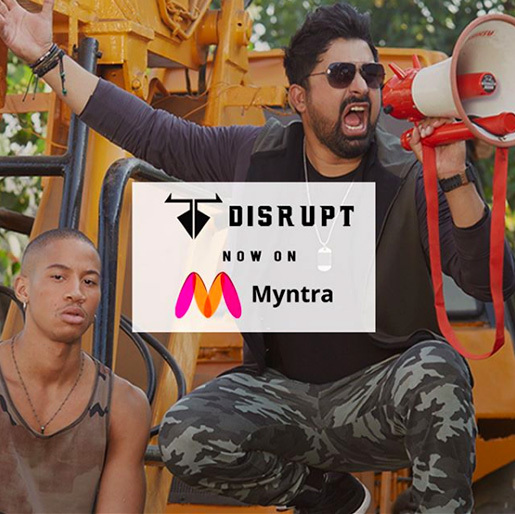 Myntra’s Innovation Lab has some exceptional inventions and conceptually unique products in store for all fans of fashion and tech. 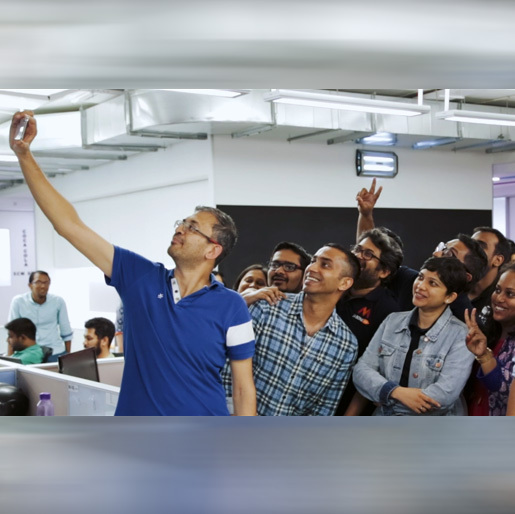 Founded in 2017, Myntra Innovation Labs’ goal is to make technological breakthroughs in the fashion industry. They have already started rolling out some of their products. First and foremost, there is the Talking Mirror app. To reap the benefits of this app, you need to take photos of all the clothes in your wardrobe to feed data to the app. Next, you need to take a mirror selfie – and the app will generate combinations for you based on the data it has already gathered. The app recognizes all clothes, irrespective of whether it was purchased on Myntra or not. 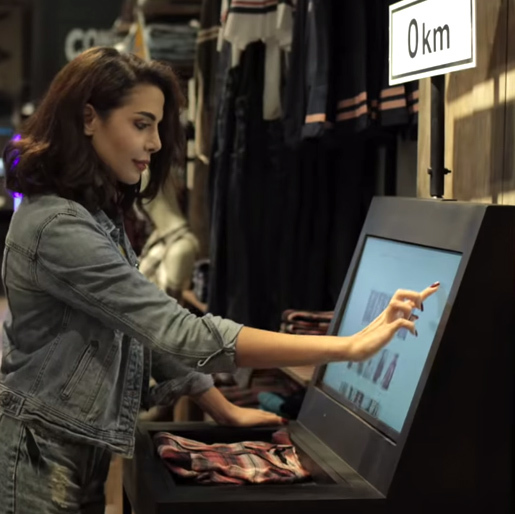 The app is also being developed to run on a kiosk, with some slight adjustments, which will be placed in physical Myntra stores like Roadster. That’s not all, Myntra’s Innovation Labs have been busy with another project – Talking Tees. Sounds interesting, doesn’t it? Well, these tees don’t talk, but they sure do shine. Under ordinary circumstances, Talking Tees will look the same as your regular graphic t-shirts. However, if you view them through a special holographic lens, you can see the elements of the graphic on the tee appear closer, move, and make patterns and designs, and much more. They are truly a sight to behold! The smartwatch Blink Go! was released during Myntra’s signature EORS sale. Remarkably, this wearable device sold out within 15 hours of its initial release. Blink Go! is loaded with a number of innovative features that do wonders for your health and mind. Apart from these, there are a bunch of other cool gadgets and devices that are currently under the works, and it won’t be a long wait for them to see the light of day. Myntra is focusing hard on their omnichannel strategy and while it is becoming the key priority, they have recently acquired a Mumbai based retail platform called Pretr. The primary specialization of the firm lies in their ability to decrease the gap between offline and online retail by offering one of a kind solution for consumers and brand. After the acquisition of the platform, forging partnerships with omnichannel brands has become easier for Myntra. It has also enabled the company to offer wide ranging solutions to retailers to further improve their own offline retail journey. To be available in both digital platforms and physical brick and mortar stores will become more essential in the coming years. A brand can’t sustain with just one wing any longer and a wider presence has become important. The customers on the website and Myntra app will now be able to explore of online and offline products of their favourite brands with ease. Several add on services like streamlined delivery process that will enable same day delivery possible, also click and collect facility will be now available. There is also the option of exchanging, returning or adjusting clothes can be now done in the offline stores of the same brand. Pretr also has a unique solution called ‘Endless Aisle’ that will enable customers who are visiting the offline stores of the brands can have a look the entire catalogue, inclusive of the inventory and stock from the other outlets. You can easily select the items that you like and pick them up later as per your convenience from the retail outlet. You can also ask the items to be delivered at your place of your choosing. This is one of the most effective acquisition done by Myntra that will help the company tie up with 50 new brands. It has been a strategic selection that will, in the coming years be available in stores. CEO of Myntra, Ananth Narayanan says that he noticed a trend in online sales. As per their data based insights, the online sale is much higher at the places where the company also has an offline store. Hence, the company’s new wing Pretr will help their private label brands deliver a richer shopping experience to all their customers. The Mumbai based startup, Pretr was founded in 2016 by Bhavik Jhaveri and Ankur Joshi. After realizing that the mélange of offline and online platform of the same brand will reap benefits they started their company. They observed a pattern in the market where offline and online platforms of the same brand were competing against one another, instead of enabling. So, they came up with a solution through which they developed solutions that would allow the digital counterpart of the brand becomes an enabler of the whole business especially the physical retail store. Eventually they added many more functionality and services as their project gained further momentum. With their power of internet technologies, they were able to achieve a lot of success. They also made the best use of predictive algorithm and machine learning to provide unique solutions to retailers and consumers alike. After the roaring success of the 1st edition of Myntra Fashion Upgrade, the online shopping website is back with its second edition and things seems to be taking off right from the beginning. It is the perfect opportunity for everyone to do a good act while upgrading their fashion statement a notch or two higher. The second edition of the Myntra fashion upgrade is going to take place from the 1st of April till the 6th and the event has already received a lot of traction. The event allows consumers to receive redeemable points for the unused clothes that they will donate to the shopping website. Myntra will there after donate all the collected clothes to GOONJ, a Delhi based non-government organization who will channelize the items to the farfetched villages in India and the urban slums. This year the fashion website is scaling the entire operation and targeting to collect over 6 lakh items. It will be a 40% increase from the 1st edition that was held in November 2017. If they are capable of pulling off the operation, this will be the largest ever collection done globally. So, if you are one of those people who have a wardrobe full of clothing items yet always complain that you have nothing to wear, this is your opportunity to help the one in need, while cleaning out your closet. Take out all those clothes that you have been saving to wear when you will fit into them or the clothes that you bought on impulse and never actually wore. Those cute tops that you thought you could wear to a party but they don’t match your personality anymore or the uncool dresses that someone gifted you but you never once tried them on, also fit the bill pretty well. Make sure to give out as many items as you can and in a state good enough that someone could wear. The more you give away, the more points you earn and you can elevate your wardrobe collection at a go. And guess what, that’s not all. The brands that are participating in this event are impressive to say the least. The in house brands of Myntra like HRX, Roadster, Anouk, All About You and Dressberry are all offering brilliant exchange offers for your redeemable points. Hold on, that’s not all! International brands like Jack & Jones, United Colors of Benetton, Vero Moda, Forever 21, and USPA, as well as domestic ones like W, Biba and Red Tape are also lining up with great offers. So, what are you waiting for? Go log in to the Myntra App or website and check out the fantastic list of fashion items that you can purchase. You will receive full assistance with regard to how and where you can use your redeemable points and use it for the best. But before that run to your wardrobe, ask your mom’s help if you want but let go off your unused clothes and revamp your wardrobe for the upcoming summers. And get ready to rock the streets with full-on glee.